How Long Does it Take to Grow Papaver Somniferum? Dried poppy pods make attractive additions to dry floral arrangements or craft projects. They are ready to harvest when the seedpods plump up and turn a milky blue color. There are several ways to dry ornamental plants at home. For poppy pods, air-drying is the preferred method, according to the Alabama Cooperative Extension experts. Cut poppy pods from the plant, leaving a stem attached. Secure the poppy pods together at the stems with a heavy rubber band, like a bundle. Don't bundle the pods tightly together, as it is best if they don't touch. Hang the bundle upside down in a dark, cool and well-ventilated place, such as an attic. Allow to hang dry for about a month. Place the poppy seeds in an air-tight plastic container. This will keep the poppy seed's temperature relatively stable and protect them from moisture which spoils the seed. Store poppy seeds to be planted in a place where temperatures will remain between 40 and 75 degrees Fahrenheit and the relative humidity is around 70%. Most pantries and cupboards meet this requirement. Refrigerate poppy seeds that will be eaten within 3 to 6 months. Freeze poppy seeds that won't be eaten within 1 year. Plant poppy seeds in the early spring or fall. Poppies are hardy flowers, and only a thin layer of dirt is needed to cover the seeds. Sow poppy seeds either in late summer or early fall, or four to six weeks before your last predicted frost date. If you sow poppy seeds in the spring, you will need to prepare the soil in the fall prior to seeding. Choose a spot that receives at least eight hours of full sun a day. Southern gardeners should plant poppies where they receive afternoon shade. Mix 3 to 4 inches of compost into the top 6 inches of soil at the planting site. Mix the poppy seeds with a 1/4 to 1/2 cup of horticultural sand. Pour the sand and seed mix into a salt shaker. Sprinkle the mix over the prepared soil. Give the seeds 1/2 to 1 inch of water to settle them into the soil. Choose a location for your poppies that provides full sun for as much of the day as possible. Poppies do not grow well in even partial shade. Till the soil. Poppy seeds will grow in almost any type of soil. Add 2 inches of aged compost and an organic fertilizer (according to the manufacturer's instructions) to help your poppies reach their potential. Mix your poppy seeds with sand to keep them from growing too close together when you sprinkle them on the ground. Broadcast (sprinkle) your seed-sand mixture where you would like your poppies to germinate. You can sprinkle them in rows, along a border or in a mass planting. Water the soil well, but do not soak it. Continue to water your poppies regularly. Poppy seeds take one to four weeks to germinate. After the seedlings reach 5 to 6 inches tall, thin the seedlings so they are 8 to 10 inches apart. This step is optional, but thinned poppies will be fuller. Papaver somniferum is also known as peony poppy, opium poppy or hens and chicks. Times vary according to location, but poppy seeds planted in the fall bloom the following spring. 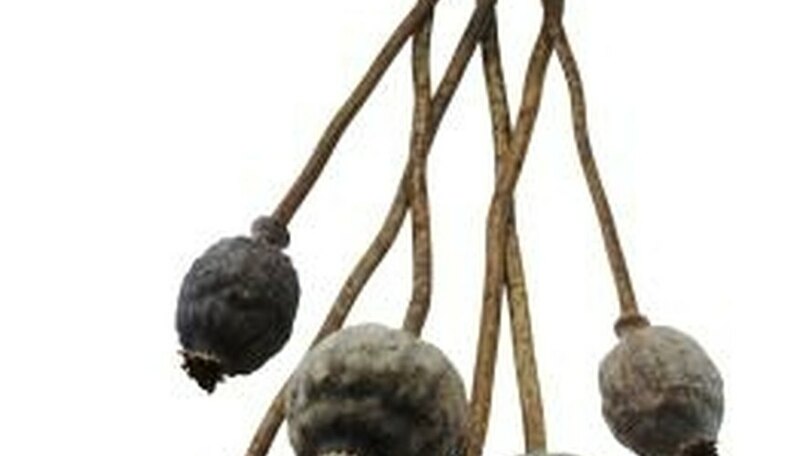 Allow poppy flowers to age and die back while on the plant and do not deadhead them if your want seed pods to develop. Prevent the pods by cutting the spent flower down at the bottom of the stalk between the foliage with secateurs. Poppies will not re-bloom with deadheading so it is not done unless seed heads are not wanted or you feel the plant looks untidy. Condition poppy flowers for use in arrangements by singeing the cut end of the stem with a match or lighter until blackened to prevent the sap from callousing over and inhibiting water uptake. Alternatively, immerse just the end of the stem in clear boiling water for 20 to 30 seconds. Place into the vase of tepid water immediately. Rake the planting area in early spring, clearing it of weeds and debris. Scatter the poppy seeds over the soil. Water the area with a fine mist from a garden hose so that the seeds won’t wash away. Keep the area moist until the seeds germinate, usually within one week. 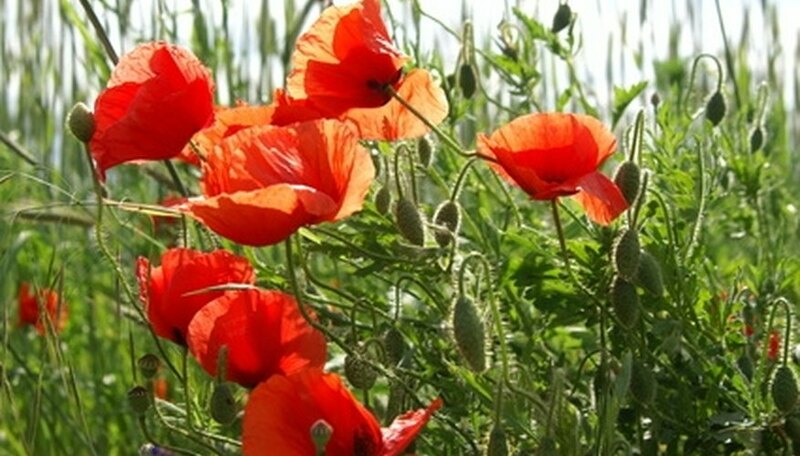 Provide the poppies with water only during extreme drought conditions. Water the top 4 inches of soil and allow it to dry. If you live in a temperate climate zone, you can scatter poppy seeds in a prepared garden area in fall. Clear the area of weeds and dig in organic compost to give the soil better drainage and nutrients. Cover seeds with no more than ½ inch of soil. In colder climates, prepare your garden soil as early in spring as you can work it. Clear all weeds and dig in compost. Scatter seeds over the area and cover them with about ½ inch of soil. If no rain occurs, water the planted area to keep the soil moist. Whether you plant poppy seeds in the fall or in spring, give them balanced fertilizer when they are 6 inches tall. Poppies should begin to bloom within three months of planting. To increase flowering, choose a low-nitrogen plant food, which you apply as soon as buds form.